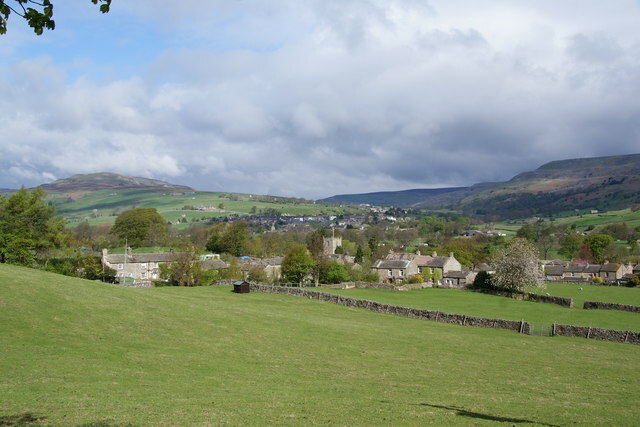 Grinton, sitting on the banks of the River Swale, is a chocolate box village that is a popular haunt for cyclists, walkers and fishing enthusiasts. Located ten miles from Richmond, the village made up part of the first stage of the Tour De France in the summer of 2014, and is home to a delightful public house which hosts folk music nights with dogs and muddy boots always welcome. The village's most famous building is St Andrew's Church. It is often referred to as 'The Cathedral of the Dales' because it was the main church for the entire Upper Swaledale region during the Middle Ages. Such was the church's importance that pallbearers used to carry bodies in wicker coffins for burials from as far afield as Keld 16 miles away. The footpath which runs between the villages has been given the name Corpse Way for this reason and walkers today can see flat rocks that were used for resting coffins on. The church's font and arch tower remain from an older Norman church that stood on the site. Some parts still exist from the 13th and 14th centuries but most of the building is dated from the 15th century. The church hosts part of the annual Swaledale Festival, which takes place over two weeks at the end of May and the beginning of June. It features folk music, jazz performances, poetry readings and brass bands as well as guided walks. Standing beside the churchyard is Blackburn Hall, a Grade 2 listed manor house that can trace its history back to 1635 and features a slate stone roof and a wing that some believe once belonged to an older dwelling that was used by Augustinian canons from Bridlington Priory. In the nearby village of Reeth travellers can visit the Swaledale Museum, which displays exhibits on rural life in the area. It is run by volunteers and stands inside a former Methodist school that was built in 1836. Another major local attraction is Easby Abbey. Situated at the other side of Richmond, the abbey was founded by Roald, the Constable of Richmond Castle, in 1152 and thrived until the Dissolution of the Monasteries under Henry VIII's rule. It is now in ruins, but remains a majestic sight and attracts hundreds of thousands of visitors each year. Grinton provides a great base for exploring the hills around Swaledale. It is also a good fishing spot with permits available for purchase on a day by day basis. Please send us details of any local information for Grinton - we will post them here. Please send us details of any local travel information for Grinton - we will post them here.